It's really difficult to comprehend the moral depths to which the anti-Israel movement in this country has sunk lately. It wasn't enough that supposedly "pro-peace" groups remained silent while Hamas ramped up its missile attacks on Israel, knowing that it would provoke an Israeli response to defend its citizens, and then condemned Israel for taking action. That's pretty much to be expected. It wasn't even a surprise that "pro-Palestinian" groups remained silent while Bashar Assad has slaughtered Palestinians (as well as Syrians) in numbers that far exceed those killed in Gaza and in a genuinely indiscriminate fashion. Because we all know that dead Palestinians only matter to these organizations if Israel can be blamed (accurately or not) for their deaths. But now, while the families in Newtown CT and all over America grieve over the murders of schoolchildren, the US Campaign to End the Israeli Occupation has sunk to a new level of intellectual cowardice. Even though Israel supplies a total of 0.31% of the American supply of firearms (h/t to Avi Mayer for researching the statistics), the US Campaign attempted to link Israel's miniscule contribution to that supply to the Newtown shootings (for the record, Adam Lanza used US, Austrian and German weapons). And what does Israel's handgun industry have to do with ending the occupation, the ostensible goal of the US Campaign? Nothing, unless you want to exploit a horrific event to smear people who had nothing to do with it. But that's not the worst of it. The real ugliness was the attempt to link the deaths of children in Connecticut-- children who were not being cynically exploited as human shields by radical Islamists, children whose playgrounds were not deliberately used as rocket launch sites, children whose homes and neighborhoods were not turned into a staging ground for jihad-- to the tragic deaths of children in Gaza who were placed into harm by those who have a responsibility to protect them. Nowhere is the US Campaign's e-mail is there a mention, much less any condemnation, of the over 10,000 rockets launched by Hamas, 100% of them aimed at Israeli children. Nowhere is there any admission that Hamas had been busily arming itself with Iranian long range rockets with the intention of inflicting as many civilian casualties as possible. Hamas leadership knew that Mahmoud Sadallah, the dead child in the posed picture with Hamas' Ismail Hanieyh and Egyptian prime minister Hesham Qandil was killed by Hamas itself, because one of its rockets fell short and landed in a Gazan neighborhood. We expect this cynical manipulation from an organization whose charter is based on the principle of "itbach el-Yahud" (Arabic for "Kill the Jew"). With this cynically manipulating e-mail, the US Campaign and its advocacy director, Josh Ruebner, have put themselves into the same moral sewer. Ali Abunimah, who runs the cheerily named Electronic Intifada website (makes you wonder if your computer will explode in your child's face if you go to the site, doesn't it? ), has involved himself in a discussion taking place on Peter Beinart's Open Zion page at the Daily Beast. I've been following, and commenting on, the site for several months and don't recall seeing Abunimah make an appearance in the comment section; I'm assuming that he's not going to be posting any columns there as he's outside even the wide latitude that Beinart gives to writers there. Abunimah's work (and fundraising) has been nicely critiqued at Warped-Mirror.com. 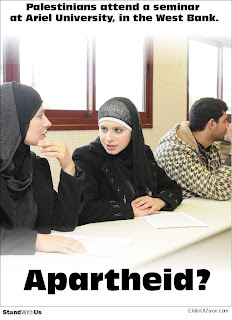 The Open Zion column in question was Hannah Weisfeld's BDS And Anti-Semitism Revisited, in which Weisfeld (a British Jew active in Yachad, the UK's equivalent of J Street) attempts to defend the BDS movement from charges that it is inherently anti-Semitic while condemning certain instances in which blatant anti-Semitism has been manifested in the movement. Let's leave aside for the moment that her premise is, as the Brits would say, rubbish. The BDS movement starts from the principle that the Jewish people have no right of national self-determination and insists on the fictional "right of return" which has no basis in international law but would conveniently eliminate Jewish statehood. 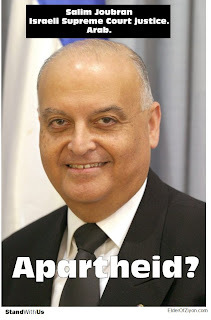 Abunimah chose to involve himself in the comment section because Weisfeld's previous post on the topic was based on information from Ali's online nemesis, Avi Mayer at the Jewish Agency for Israel. (Anyone who is on Twitter who wants to keep abreast of issues should follow @AviMayer. He is the one who broke the story on the anti-Semitism spread on social media by Greta Berlin, the now discredited former head of the now even further discredited Free Gaza Movement.) When challenged by this writer in a comment post with the basic question ""Do the Jewish people have a right of self-determination in [at least a portion of] their historic homeland?" he responded by linking an article he had written in 2010 . Normally I don't link to hate speech, but this is worth reading for an insight into the extremist anti-Zionist argument couched in human rights terms; people like Abunimah realize that the language of liberalism reads much better than the jargon of jihad, even if the end goals are the same. My response to his article is posted on the site, but I wanted to share it here as well. If Ali wants to respond, I'll post it. "Your article is a very clear renunciation of the right of the Jewish people to our own national self-determination. And of course it is also riddled with errors of history and fact. Let's start with your deliberately pejorative phrase "settler-colonial Zionist forces". They of course were not colonialists in any way; they were not carrying the flag of the countries from which they were fleeing, but rather seeking to escape them by returning to their people's homeland. Quite different than the Arab immigrants into the Mandate who came for improved economic opportunity. And they were not "forces"-- they were individuals, mostly peasants and working class but some middle class. Trying to recast the Jewish people's return to their homeland as similar to the European practice of turning Africa and Asia into outposts of empire, ruled for the benefit of the home office, is a common rhetorical trick that you and other anti-Zionists employ. It doesn't go far with any audience that is familiar with history, which means that it's wasted on most readers of this site. You also refer to the "fundamental rights of millions of Palestinian refugees". Those "rights" of course, do not actually exist. Individual refugees, under international law (which is made by treaties, not unilateral decisions of the UN GA, much less those of UNRWA) have rights upon the settlement of a conflict. Perhaps the only point on which we will agree is that this conflict is not anywhere close to settled. Descendants of such refugees do not have similar rights anywhere in international law. Nor was Palestine, at any point prior to the British Mandate, an "indivisible homeland". Since the existence of the Judean kingdoms and then the Roman province of Judea, there is no map of the region that shows Palestine as an individual entity. Nor is there any mention of a people--aside from the Jews-- that consider themselves indigenous to the region until modern times. Need I remind you of the use of the term Naqba to describe the separation of the Arabs of the British Mandate from what they saw as their countrymen in Syria (under French Mandate)? Yet while you insist that the modern self-recognition of the Palestinians must be somehow applied retroactively to all of history, you exclude the Jewish people-- the only ones who are uniquely indigenous to that area and whose presence for 3 millenia is literally engraved into that land-- from the same consideration. By the way, I'm sure you recall that when Arafat gave that 1974 speech from which you quote, the PLO Charter called for the expulsion of all Jews whose families arrived after 1917. I know that's an inconvenient fact which you would prefer to leave unmentioned. The comparison to Northern Ireland is fallacious. There is no "northern Irish" people seeking their own national self-determination. But the reference to Ireland is relevant. If someone who is Irish living outside the Irish Republic wished to return to that part of his people's homeland which is independent, he can immigrate to Ireland-- and the country has laws that provide automatic rights of citizenship for those whose parents or grandparents were Irish subject to certain requirements. Similarly, Israel provides citizenship rights to members of the Jewish people, and a future Palestinian state should of course provide such rights to Palestinians wherever they may be residing. Your call is very clear-- remove the Zionist (eg Jewish) character of the state of Israel. 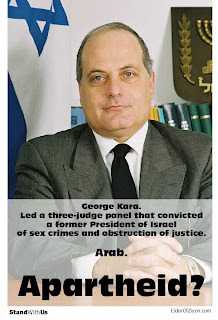 This will of course result in the same phenomenon seen throughout virtually all of the Arab world-- institutionalized apartheid against Jews who will be subject to the dhimmitude under which they lived prior to their expulsion, and the tyranny of the Islamic majority against the infidels as we have seen in Iraq, in Gaza and now developing in Egypt. Show me a Middle Eastern Arab state that treats all of its Arab citizens with equal rights before you start trumpeting promises that your 24th Arab majority state would do the same for its Jews." Jewish Voice for Peace has released a 6 minute animation which purports to be an introduction to the Israeli-Arab conflict. Like much of JVP's other work, it's cute, simple-- as well as wrong on the facts. It's also misleading with respect to JVP's actual agenda, which includes consistent support for "river-to-the-sea" rejectionist groups and support for BDS. It doesn't take long for them to mischaracterize the entire history of the modern Zionist movement. Their opening sentence frames the entire issue as "building a refuge for a persecuted people in a place where another people already lived." While Westerners did both understand and sympathize with the need of the Jewish people for a land where they could live free of the pogroms and second class citizenship that marked their lives in much of Europe (as well as lands under Islamic rule, though that story wasn't as well known at the time), the goal of political Zionism was creating a Jewish state. Only in our own state, not a protectorate of someone else's empire, could the Jewish people fulfill their own rights to national self-determination. As Jean-Jacques Rousseau wrote in his book "Emile, or On Education" in 1762: "It seems to me we will never come to understand what the Jews are saying until they have a free state, school and universities in which they will be able to speak freely and discuss matters without danger. Only then will be we able to know what they have to say." The Zionist movement specifically rejected the British offer of Uganda-- because what they sought was NOT a refuge in a foreign land, but a return of the Jewish people to the Jewish homeland, a land whose indigenous population was the Jewish people and which, since the fall of the Jewish nation to the Romans, had always been ruled by an outside power. While the video insinuates that someone else built it on behalf of the Jewish people, it was Jews themselves who built up the land. They were not only "building a refuge"-- they returned to their homeland to build a state. This process started under Ottoman rule with Jews buying land legally according to Ottoman law to facilitate the return of an exiled people to their historic homeland. Did "another people" already live there? That's a highly debatable point, given that in the 19th century there was no national movement of the Palestinian people. Other people certainly lived there--approximately half a million Arabs, but not as a national group. The phrase "Palestinian" was used at that time to refer to Jews residing in the British Mandate of Palestine. The Arabs of Palestine considered themselves part of the Syrian people-- the original use of the term "Nakba" ("catastrophe') in the Arab press was in reference to 1920, when as part of the carving up of the Ottoman Empire after World War I, the French agreed to separate Syria from British Palestine and the Arabs under British rule were cut off from what they saw as their fellow Syrians. At least as the video goes on there is actually acknowledgement that Jewish communities had existed for centuries in the area (which makes me wonder what JVP thinks about the incessant PA propaganda that promotes the myth that the Jews never had a history on the region, propaganda that is eagerly digested and regurgitated by many of the groups with which they choose to collaborate). Though the statement that Jews came to Palestine fleeing the Holocaust is incorrect-- as any student of the history of the region knows, the British cut off Jewish immigration in 1939 after 3 years of Arab riots led by the Nazi sympathasizer Haj Amin al Husseini, the British-appointed Grand Mufti of Jerusalem. 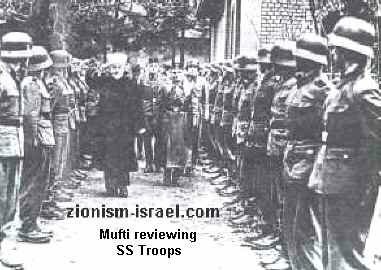 (al-Husseini would spend some of the war years in Europe-- meeting with Hitler, broadcasting on Radio Berlin, recruiting Muslims for the SS, and planning with Himmler to build an Auschwitz-style extermination camp near Nablus in the event that the Germans conquered Palestine). The video also conveniently omits any mention of extensive Arab immigration to the area in the years between the wars. This Arab immigration was not driven by persecution, nor was it composed of those seeking to return to their historic homeland. Rather, it was attracted by the increasing standard of living in the area due to the work of the Zionists in building up roads, hospitals and other infrastructure. Now we get to the heart of the video's misrepresention: the 1947 partition plan and its aftermath. The cause and effect stated by JVP is clearly backwards-- Palestinian society was destroyed not by the partition plan, but by their decision to go to war against the Jews, deciding that preventing the establishment of a Jewish state was more important than creating their own. While the Jewish mayor of Haifa was publicly urging his Arab neighbors to remain in the town, the Arab Higher Committee insisted that they leave; Time Magazine wrote on 3 May 1948: "The mass evacuation, prompted partly by fear, partly by orders of Arab leaders, left the Arab quarter of Haifa a ghost city ... By withdrawing Arab workers their leaders hoped to paralyze Haifa." The video notes that "several" Arab armies invaded Israel; it might have been appropriate to mention that their goal, as with the Arab population of Palestine, was not a Palestinian state but the destruction of the Jewish one. Had the Palestinians accepted the partition plan, there would have been no war and no refugees, and Arab villages would not have been left as ghost towns to be built over. Even Mahmoud Abbas recognizes this choice as one of the two worst decisions made by the Palestinians. At 1:18, there's a unique re-interpretation of history-- a map that shows the 1949 armistice lines with an Arab state in the area outside Israel. That might be news to West Bank Arabs who lived under Jordanian occupation and Gazans who lived under Egyptian occupation-- with no move in the Arab world to create a Palestinian state in those areas. The statement is then made that "three quarters of a million" Palestinians tried to return to their homes in Israel. While indeed there were some refugees who attempted to return over the Lebanese border in the summer of 1948 and were turned back, there's no historical record of hundreds of thousands of Arabs attempting to return. Now as far as those that were turned away, is there any precedent for a country allowing a refugee population back into the country they launched hostilities against? Those who actually have studied the history of the conflict know that attacks against Jews were launched from many Arab villages, and the guerrilla force in the Galilee led by Fawzi al-Kaukji was sheltered and supported in many of these same villages. The fate of Arab villages was often tied to their decision to participate in the war against the Jews. Near Jerusalem, the leaders in the village of Abu Ghosh did not participate in attacks on Jewish convoys to Jerusalem-- and remained in their homes. Neighboring villages did-- and paid the price, established long ago in human history, for losing a war that they started. "To sum up" (as the narrator says at 2:00), the outcome of the creation of Israel was not the substitution of one group of refugees (the Jews) with another (the Palestinians). Prior to 1939, it was a return of the Jewish people to their homeland. After 1948, of course, there were many Jewish refugees from Europe who immigrated but they were not the cause of the Palestinian exodus. The Palestinian refugee population is more properly paired with the Jewish refugee population from the Middle East and North Africa. In a deliberate, pre-panned action against their own citizens put into effect immediately after Israel's declaration of Independence, Jews living in Arab countries became immediately subject to legalized discrimination, dispossession and expulsion. These Jews were not engaged in armed combat with their neighbors. They were targeted as Jews, as revenge for the creation of a Jewish state in what was then (and still is today) seen by Arab rejectionists as "Arab land". This population, greater in number than the Palestinian refugees, was the other side of the coin in this population exchange, mirroring those occurring in other areas in the 20th century such as India/Pakistan and Greece/Turkey. Next we move on to the favorite meme of JVP and its extremist allies: that Israel is, by its nature, a racist state. And of course they are wrong on the facts again. The discussion of what it means to be a Jewish state in this century is a vibrant and important one, led by intellectuals and scholars such as Daniel Gordis but involving large numbers of Jews both inside and outside of Israel. And in those conversations (as well as under Israeli law) the overwhelming national consensus is that in a Jewish state, Israel's Arab citizens indeed must have equality under the law. And they do. 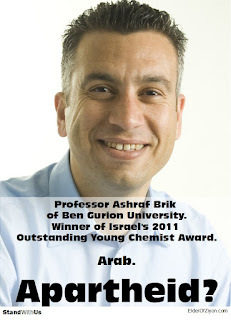 While in the first few decades of Israel's existence there were discriminatory laws against Arab citizens (over the same time period in which many American states enforced legalized discrimination against African Americans), currently Israel's Arab citizens vote, attend universities, access public services, and hold political office on a basis of equal rights with the Jewish citizens. While there were discriminatory land laws in the past, it's now prohibited even for the Jewish National Fund, owners of land bought by donations on behalf of the Jewish people, to refuse to sell land to Arab citizens. Now let's talk borders. Indeed Israel has not defined its permanent borders completely-- that's in part because its neighbors until recently refused to sign a peace treaty and establish normal relations. Israel has defined borders with Egypt and Jordan, and has armistice lines established with Syria and Lebanon. The borders on the West Bank, which has not had a legal sovereign since the end of the British Mandate, indeed remained undefined, awaiting a peace settlement between Israel and a Palestinian leadership that will agree to live alongside the Jewish state in peace and mutual recognition. But it would be news to Israel, and to Hamas, that Israel still occupies Gaza, as the video claims at 3:05. Maybe JVP wasn't paying close attention to the fact that Israel left Gaza in 2005, and that there are no Jews there at all (except for the occasional misguided passenger on one of the ships of fools that attempt to bring used shoes, expired medications and jihadist fighters to Gaza). Finally, at long last, we come to what JVP wants you to believe is the heart of the issue for them: Israel's occupation of the West Bank. And indeed, many Israelis and Israel supporters who support the concept of two states for two peoples (not one supported by JVP) share the concern that this is becoming permanent. But we now get to staggering distortions-- not only the visual of bulldozers turning the West Bank blue (built-up areas of settlements comprise 2-3% of the land area of the West Bank) but of the whitewashing of Palestinian terror and rocket launching as "resistance" and "armed struggle". In JVP-land, Hamas doesn't launch rockets at 3.5 million Israeli civilians, Israel merely bombs a "captive civilian population in Gaza". And the al-Aqsa Martyrs Brigade suicide bombers didn't blow up busses and restaurants using bombs filled with nails and rat poison (to prevent blood from clotting and thereby having victims bleed slowly to death if the bomb didn't kill them instantly), but rather Israel "punishes resistance with raids, arrests and assassinations". The next time I hear a Palestinian terrorist group such as Hamas or Palestinian Islamic Jihad state that they are only seeking a state in the West Bank and Gaza and will then agree to live in peace with Israel-- that will also be the first time. They seek the liberation of "Arab land" such as Tel Aviv and Haifa just as much as Hebron, as was stated repeatedly during this weekend's festivities in Gaza celebrating 25 years of bus bombs, missiles and rockets. Hamas and other Palestinian terror groups have been extraordinarily clear on not only their river-to-the-sea agenda, but on their overt Jew-hatred. Yet JVP's view of the situation conveniently excludes them from the narrative except for a brief aside, because they don't fit into their distorted construct of noble oppressed peace-seeking Palestinians bravely resisting the evil racist colonial Zionists. Their narrative on peace talks also leaves out some inconvenient truths: the offers to the Palestinians in 2000 and 2008 for a contiguous state on 100% of Gaza and 97% of the West Bank, rejected by Arafat and Abbas respectively. If they were so desperate to end the occupation and establish a Palestinian state, then why not accept what they claimed to seek? The real heart of the conflict at this point involves two points of contention: refugees and recognition. Are land and borders an issue? Absolutely. But for JVP to claim that this is the core of the conflict ignores not only the statements of the Hamas Charter that "the land of Palestine is an Islamic Waqf" but even the "moderate" Mahmoud Abbas' statements insisting on the fictional "right" of return and rejecting a Jewish state. That's because JVP's real agenda is supporting groups (such as Sabeel and American Muslims for Palestine, which has been openly supportive of those convicted in US courts for aiding Hamas) and movements (such as the BDS movement) that all share the vision of one (Arab majority) state from the Jordan River to the Mediterranean Sea. To that end, they want Israel to be forced to accept descendants of Arab refugees from that failed genocidal war in 1947-8 as citizens, to change Israel from a state of the Jewish people to a "binational" state along the highly successful models of Bosnia, Lebanon, Rwanda and Iraq. While the trend worldwide is for increasing the number of countries to allow each national group to exercise its rights of national self-determination (see Soviet Union, former; Czechslovakia, former; Kosovo; South Sudan) the anti-Israel forces realize that once Israel is no longer the state of the Jewish people, it starts down the road of no longer having millions of Jewish people. That's why acceptance of a Jewish state is a part of a final settlement-- it's accepting that the state of the Jewish people is legitimate and that efforts to eradicate it are over. JVP has a long track record of endorsing, supporting and partnering with "one state" groups and efforts. It has not endorsed any groups or efforts that support peace between an Arab state of Palestine and a Jewish state of Israel. At least their coalition partners, such as American Muslims for Palestine, are open about their goals. And a cute little cartoon doesn't substitute for the moral, political or intellectual integrity to admit what you really stand for.